Posted March 28, 2013, in News. Thursday April 4, 12:20-1:20, in the 429 Cooper Street building first floor Seminar Room. Much has been made of his debt to Scottish philosophers, ancient ethicians, and even Jesus concerning his moral-sense ethics in Jefferson’s writings. Such “wild” eclecticism, it is generally assumed, does not allow for a consistent take of his ethical views over time. That view, I argue, is unsustainable. 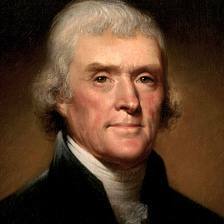 Jefferson’s view of the moral sense, I aim to show, develops and matures over time, without substantial change, through a fuller appreciation of virtue as self-fulfillment, of Christian beneficence, and of Stoical psychical equilibrium within a moral-sense lens. Page last updated by Department of Philosophy and Religion at 5:01 pm March 28, 2013 . This page was printed from http://philosophyandreligion.camden.rutgers.edu/2013/03/28/prof-holowchak-talk-on-jefferson/ at 4:47 PM Friday, April 26, 2019.